This is my favorite way to use up jam right now. 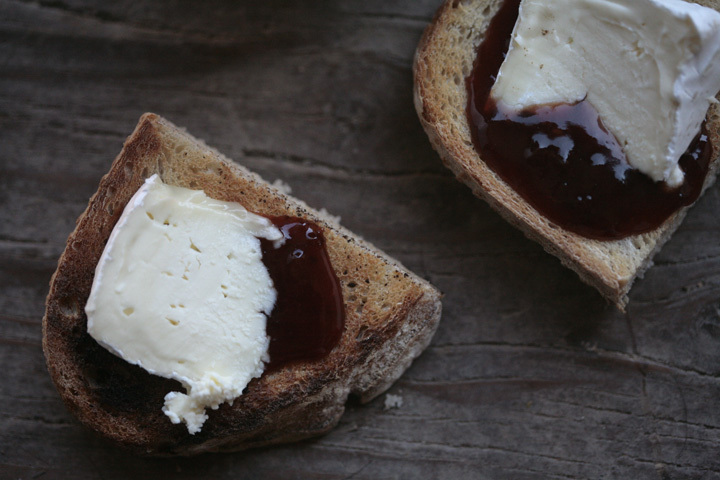 chocolate-plum jam with cowgirl creamery mt. tam cheese = i’m eating it for breakfast, whether that’s an appropriate breakfast or not. eggs be damned. 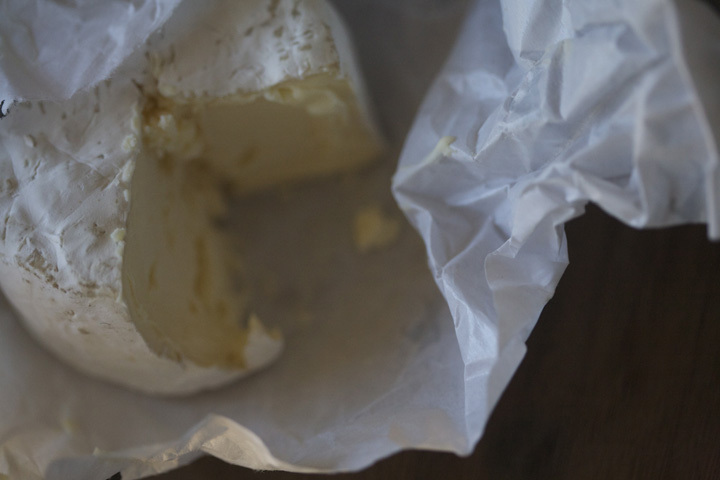 Cowgirl Creamery cheese is insanely expensive but 100% worth every penny and totally delicious. * Chocolate plum jam, on the other hand, is dirt cheap if you make it when there are lots of plums around. The original recipe, which I wrote last summer, is here. Since I am so incredibly happy and humbled to be up on Freshly Pressed today, I want to share a few tweaks that I think make it even better. This is absolutely one of the best jams I’ve ever made and I hope that you bookmark it for when the plums come in so you can make it too. Thank you, thank you, thank you for reading. I can’t say it enough. Bring boiling water canner to a boil. Combine all the ingredients in a large, nonreactive pot. Cook on high heat, stirring occasionally to prevent the plums from sticking and burning. Cook until the jam reaches 220 on a candy thermometer, or whatever your preferred method of testing for gel point is. (I realized my candy thermometer is a piece of crap and not accurate at all, so I’ve just been doing the sheeting method with the spoon I stir the jam with- click this link for a picture if you don’t know what I’m talking about). Before you put the jam into jars, you can remove the sage leaves if you want. I actually gave the whole thing – sage leaves and all – a zap with my immersion blender since I was using frozen plums that didn’t have much in the texture department anyway. Purée it or leave it chunky – either way is fine. Pour the hot jam into clean half pint jars, leaving 1/4″ headspace. Wipe rims and screw on lids. Process half pints for ten minutes (adjust for altitude if necessary). *they didn’t pay me to say that or anything, the Cowgirl Creamery people definitely don’t know who I am. Chocolate plum jam! I am so making this this summer. I just cleared out the last of last summer’s plums with a batch each of plum and plum-ginger jam–can’t wait to try your recipe! YUM. I made some plum jam last year, it was delicious – it must go so well with chocolate added. Oh, if I am able to find plums this summer, I am definitely making this. Sadly, folks around here don’t raise them much. And this looks like a perfect breakfast (or for that matter, any meal) to me! OMgoodness, the plums just fall on the ground every yr. In our area every one has an abundance. I am going to make this jam this yr. it sounds lovely for Christmas gifts. Where do we get Cowgirl Creamery Cheese? Oh wow, that sounds and looks amazing. I love a good plum jam, team it with chocolate and cheese and that’s just about heaven on bread isn’t it. Now I just need my very small plum tree to get growing – and wait for Spring as it’s Autumn here right now. emmy- i’ve been meaning to do a plum/ginger combination, it’s totally on my list for this summer! frugal- plums and chocolate are a great combo, it’s true. this jam is inspired by a dessert i made on a whim once, just sliced plums dipped in dark chocolate and rolled in crushed hazelnuts. it melted my brain it was so good. michelle- i hope you can find some plums! barbara- i’m sending your little plum tree happy growing vibrations! we planted two years and years ago and finally, this summer it looks like we’re going to have a huge plum harvest. mt. tam is seriously addictive, it’s so true! I’m glad you liked the jam, that’s always so great to hear. This jam is fantastic! I loved the first batch so much, I just had to make a second. The chocolate taste is subtle, and the balsamic and sage add just that perfect kick. Love, love, love it. hey there!~ just googled chocolate and plum jam as we’re making jam from roadside plums we gathered here (Gippsland, Victoria, Australia) and have Dutch chocolate on hand (and lots of plums!!!). Sage and balsamic was unexpected… but I’m giving it a go! Thanks for your recipe!